The Very First U.S. Dollar Bill Featured A Portrait Of? What Modern Computer Term Derives Its Name From Metal Casting? The very first dollar bill issued in the United States hit the printing presses in 1863 and featured a visage few today would recognize. The portrait on the first dollar bill wasn’t of a past president, war hero, or early American luminary whose face and name remain in popular imagination even today. 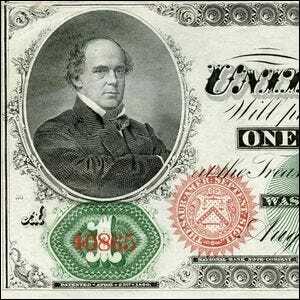 Instead, perhaps more practically, the portrait that appeared on the first dollar bill was simply a portrait of the then-sitting U.S. Treasury Secretary, Salmon P. Chase. He remained on the dollar bill until 1869 when the dollar bill was revised and the portrait replaced with one of first U.S. President, George Washington. Salmon’s run as a portrait model for currency wasn’t over, however, as he later appeared on the 10,000 dollar bill, a high denomination certificate used to trade currency between banks. Image courtesy of the Natural Museum of American History.